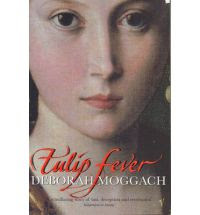 The book that my teaser comes from today is one which I am reading for the Art History Reading Challenge, Tulip Fever by Deborah Moggach (page 143). I am cheating today and posting a couple more sentences than I am meant to, but I think it makes more sense this way. Just bags of onions, that is what they look like. For them, Jan has paid as much as he makes, with luck, in a year's work. How homely they look. Yet they are more valuable than jewels, than paintings, than gold. Stored within those bulbs, fattened by sunshine and rain, is his future. Ooh, I'm curious about this book! I was reading something about the whole tulipomania thing just the other day. It sounds like a fascinating period to read about. Most interesting. Weren't tulips used almost as currency? Imagine pinning all your hopes on a flower! Wow...this is a great teaser for the book! I'm hooked already and I want to find out more! Thanks for sharing! Sounds like an intriguing book. Nice teasers! oh this sounds good. I have to check this book out. I like the title. Looking forward to reading what you think of the book. What an intriguing teaser. The cover art is beautiful and I look forward to reading a review! That's a fascinating teaser. I'll have to check out the book. Wonderful teaser, makes me want to read it. What are your thoughts on this book? So far, is it capturing your attention? Based on your teaser I am very curious to know if it's a good read. "Of course, it may be that I am erroneously measuring others against myself. Others may find that the truth of perfect faith is enough to inspire them to do perfect things, whereas I am such a poor wretch the I need much more. In fact, I need everything." What an interesting teaser, and I know a few people who have a lot invested in their gardens. . . and bulbs! Sounds intriguing Marg. Now I'm curious about the surrounding story.